Is the Grenadier Pub Haunted? The Grenadier pub started off life as an officers mess inside the courtyard of the barracks for the 1st Regiment of foot guards. It was built in 1720 and was just an ordinary mess hall for the officers of the regiment, serving this purpose until just before 1818 when the regiment moved and the building was no longer needed. 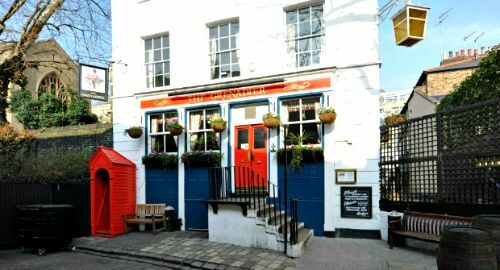 After this it opened to the public as a pub and was named "The Guardsmen", though it was renamed shortly afterwards in honour of the Grenadier guards accomplishments at the Battle of Waterloo. Since it was in one of the wealthier areas of the city it has become a favourite watering hole for some famous figures, including King George IV and the Duke of Wellington. Even today it hasn't lost its attraction for the stars and continues to attract people such as Madonna and Prince William amongst others. Today the pub is open to the public as any other normal pub is and the owners are normally quite happy to share the ghostly tales they have of the place. The most well known ghost at the Grenadier pub is thought to be the spirit of a young army officer from the late 1700's. The story goes that he was drinking and playing cards in the building with some of his fellow soldiers, and after a series of wins he was accused of cheating. An argument ensued and it ended with the officer being beaten to death on the spot. The date that this occurred is unknown, but it is thought to be during sometime in September as paranormal activity here seems to peak in this month. This incident is thought to have started the ball rolling for ghosts at this place, as after the officers death more and more stories of strange things happening here just kept coming. As for the officer himself he is thought to appear in the form of a shadowy figure, to dark to make out any features, but many people have claimed to have seen him in the bar area and felt icy chills when he appears. Other hauntings here seem to include a lot of noise activity. Claims of hearing things such as doors slamming and chairs sliding across the floor in the upper rooms when they are known to be empty. The building also seems to suffer from some Poltergeist activity, with stories such as various objects sliding across the floor or bar right in front of people. There is even a well known tale of this place about how when the Chief Superintendent of New Scotland Yard visited. Apparently smoke suddenly started to waft around him where he was seated and then he was burnt by a cigarette, even though no one was smoking in the room at the time.